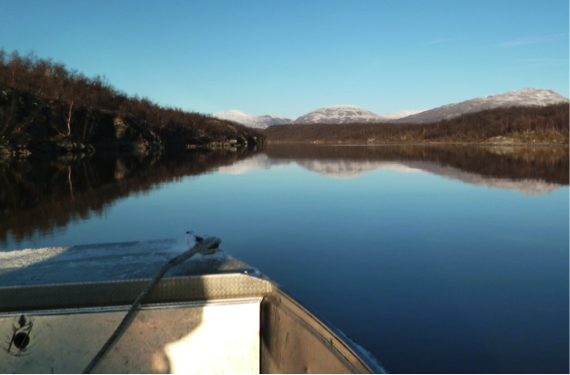 After two successful sampling days on the lake we now have samples from three distinct riverine inputs, Abiskojåkka, Njuoraätno and Miellejåkka. See the previous blog post for pictures of the glorious mud itself! The sites didn’t give up their sediments easily though with sand and gravel dominating the shallow depths making for tricky grabbing. Whilst difficult to get samples containing organic matter (needed for our analyses) it was fascinating to take the boat right up to the limit of the Njuoraätno inlet, which included passing its textbook sandy spit, a geomorphologist’s wildest dream. Motoring up the Njuoraätno inlet. Once we moved offshore from the inlets into deeper water it was like striking gold after the anticipation of reeling the grab back up to the surface, then finding it full to the brim. Particularly interesting were the coloured layers in some of the sediments, indicating differences in the source of the material and potentially the type of microbes living in them. The previous night’s dusting of snow added a whole new dimension to the amazing scenery but made for a very chilly day out on the water. Later on, back in the kitchen and warmed up we took stock of the samples, making sure everything was in order and labelled correctly, important because of the time and money invested in collecting them. Thursday, our final day in Abisko before flying home was spent checking data, writing and looking into obtaining further information on the catchment of our sampled rivers. This may be important for explaining patterns in our results. We enjoyed a good Fika with others based at the station before taking a casual drive into Norway to skim stones in a glass-like fjord. Chilly feet – or first day in the field.. Accompanied by espresso and a beautiful view over Torneträsk with snow-capped mountains on the horizon we started our day with planning where to go. After asking people working at the station, and digging into some papers on the lake we decided to try and sample around the Abiskojåkka delta. The Abiskojåkka (jåkka is river in Sami-language) drains a catchment of about 560 km2 with an average elevation of 950 meter above sea level. Particularly during rain storm events it carries tremendous amounts of terrestrial material that it deposits into the bottom of Lake Torneträsk as sediments. After a solid lunch of eggs and bacon (we learned in Siberia to eat heavy…) we met with Thomas Westin (from ANS, see picture below) at the boat launch, got geared up into floatation suits and took off. The weather was good (although slightly chilly) and the lake relatively calm. Our plan was to sample along a transect from close to the delta (lots of land-derived material) to further out (less land-derived material). With a warming climate it is likely that Lake Torneträsk will receive more land-derived, terrestrial, material in the future so we are interested in seeing how the lake reacts to inputs from land. Back home we will for example look at microbes that can process organic matter from land. We heard that this part of the lake has lots of sandy and pebbly bottoms, but we were lucky to find quite a lot of fine mud. Our small Van Veen grab sampler worked wonderfully. And as a bonus we even spotted a floating dead lemming! In perfect timing, we made it back to shore just as the snow started to fall. After this successful first day out, we hope to continue the mud collections tomorrow all being well. The team was to meet in Stockholm airport for the same onward connecting flight to Kiruna, en-route to our final destination at the Abisko Research Station. Jorien was travelling in from Utrecht via Stockholm, whereas Paul and Sam were flying in from London. Courtesy to a delay to the London flight, the team finally met to everyone’s relief on the tunnel boarding the plane, after some frantic running through airports. Despite the minor panic, the rest of the journey went by smoothly. 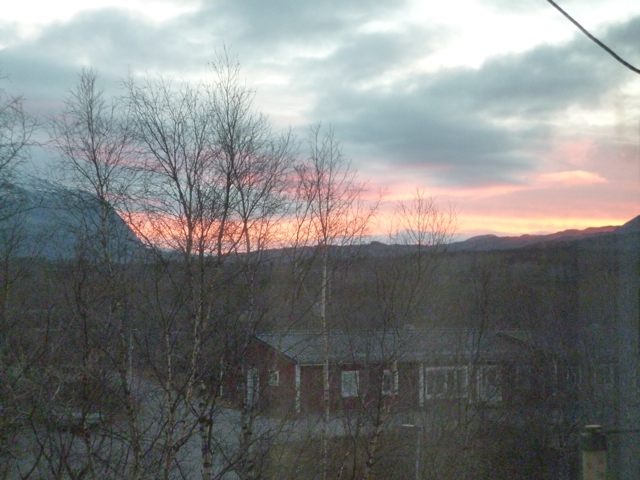 After arriving in Kiruna we were happy (and amazed!) to see that our baggage had also made the break neck journey. We jumped into our luxurious hire car and headed for the centre of Kiruna to stock up on food and supplies for our short week stay. We then started up on our one-hour journey to the station, which was slightly extended by stops for photos. After driving for only around 40 minutes, the imposing sight of Lake Tornetrask came into sight providing us with our first glimpses of our study site. Lake Tornetrask is the largest mountain lake in Scandinavia and second deepest, yet despite its importance very little research has been conducted here especially in terms of the microbes living with its sediments. Before long, we were arriving at Abiskso Research station, where we happily let ourselves in and explored where we’ll be living for the next few days. Walking into our kitchen we were greeted with spectacular mountain views and an incredible view over the lake. 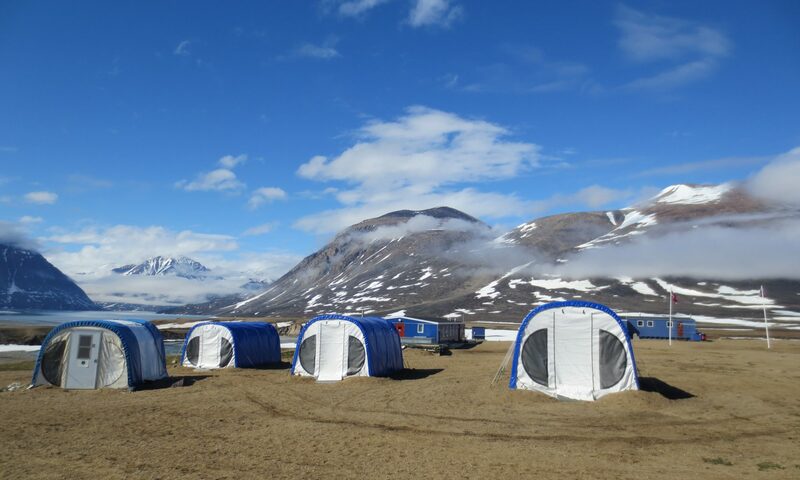 It can be said that the research station offers excellent accommodation for visiting researchers in a unique setting. The rest of our evening was spent preparing sampling gear, getting familiar with maps of the area and enjoying our first meal of Reindeer Stew (?!).. 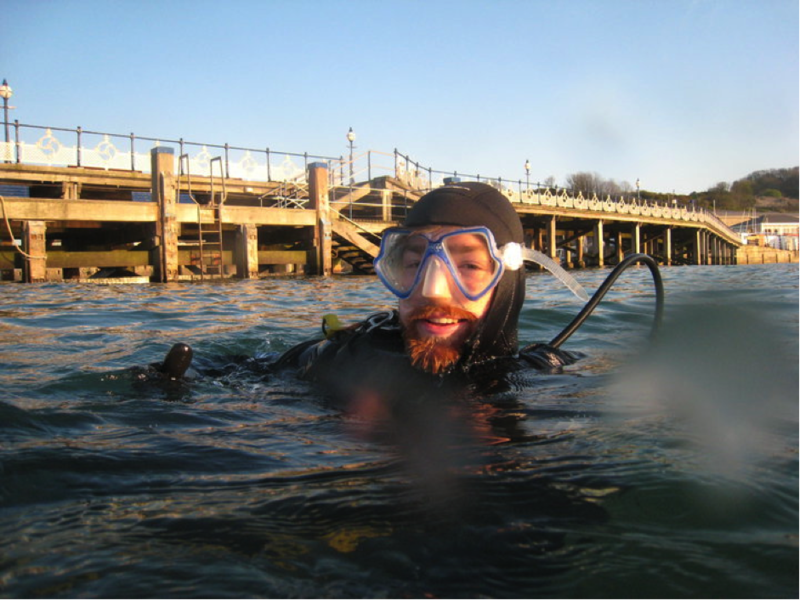 We hope to start sampling tomorrow, weather permitting..
Hi, I am Samuel Cottingham, a shiny new first year PhD student based at Northumbria University, Newcastle, UK. Being less than two weeks into my PhD, I’m very lucky to be making my first ever trip to the Arctic to collect samples for my research.